Take a walk through the orchard, fill your bags with different varieties of apples. And, of course, fill your childs pockets with goodies from from the salesroom. 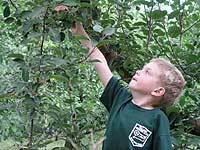 See the harvesting schedule to see when your favorite apple is in season! For more about the farm click here. In a day and age when television and computers occupy our family time, picking your own apples from the tree or pumpkins from the fields is the perfect way to bring the family together for affordable fun! Cameras are a must to record those memories for years to come.